Aquatic plants will look lovely in the pond whether they are submerged or floating. There is also an abundance of marginal plants that would be terrific lining the koi pond edges. The variety of textures and color will add to the beauty – the water plants with bob and flow providing a soothing environment while the border plants will draw in the eye. You won’t need to use only customary pond plants to design a beautiful and wildlife-friendly landscape. The area around the pond will offer a drier setting for interesting and diverse flowering perennials and native grasses. Koi pond plants come in categories which include submerged, marginal, bog, floating and emergent. Before making a decision, do some research or work with a local pond plant expert to determine what need, growth habits and size will work best for your situation. Submerged plants grow entirely underwater. They will add a bit of mystery to your koi pond and offer an environment for the fish to hide themselves away. This type of plant are oxygenating with means they will pull carbon dioxide from the water and then release the useful oxygen after photosynthesis. They do not require plant food as they will feed off the excess nutrients living in the pond water. Examples of submerges plants are anacharis and cabomba. Bog plants, also called marginal, are species that like to reside in the shallow waters or the deeply wet soil found around the edge of the koi pond. They are known to have a healthy root feeding process that will pull their nutrients from the soil. These plants are valued because they mine harmful nutrients from the pond water before they build up. Popular bog plants include cattails and irises. Emergent plants may be the best known because of their wide popularity. The most commonly used are waterlilies and lotus. Their deep water emergent roots grow under the water in planters placed on the bottom of the koi pond. Their beautiful foliage and flowers grow upright and open up at the surface of the water. The koi appreciate the shade they provide. Floating plants do exactly that – they simply float on the surface of the water while their root system drifts down and acts as filters. These lovely specimens also serve a practical purpose. They pull nutrients from the water which discourages algae resulting in cleaner pond water. They will grow quickly and are vital for maintaining a healthy environment. Popular floating plants include water hyacinths and water lettuce. For submerged and emergent plants consider using planting baskets. These containers will allow you to move plants around as they grow. Use a quality planting soil in the baskets as well as the rims of your koi pond. You can give the soil a more polished appeared by covering with small rocks. This also prevents damage from nibbling koi and the currents in the water. Make sure the plants you choose are hardy for the Texas region so they will thrive, develop lushly and protect your investment. Take care to ensure that floating plants are secured (try a fishing line to a rim rock) so they will not interfere with your skimming system. To enhance your koi pond, consider using rocks along the edge. Beyond beautifying the landscape, they make a terrific shelf for water plants, hold the pond liner in place and attract interesting wildlife. For inspiration, take a walk around a natural creek in your neighborhood. Good choices for rock material include sandstone, granite, limestone and flagstone. These can be purchased from a retailer or rescued from a neglected creek bed. There are many good reasons from adding a koi pond to your yard – aesthetic appeal, developing nature, improving real estate value, creating a peaceful environment. Some folks even believe that having koi will bring you good fortune. Whatever your reason, take that extra step to improve the beauty and environment of your water feature. 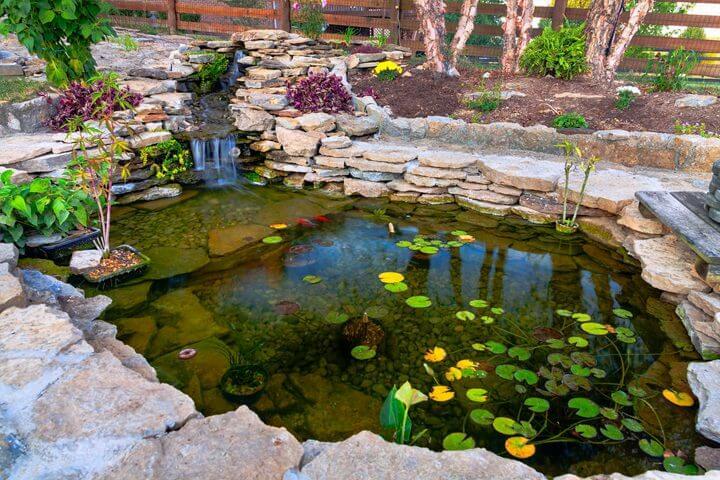 Dress up the koi pond with plants and rocks to realize the full enjoyment.